Secluded and quiet, within walking distance to the lagoon. Sip your morning coffee on the deck. Relax and unwind in front of the cable TV. Sit down with friends and family at the dining table. 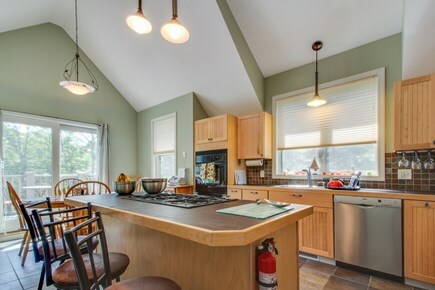 Cook a five star meal in this fully equipped kitchen. Get a good night's rest in this queen size bed. Recharge in this queen size bed. There is room for two to sleep in these twin size beds. 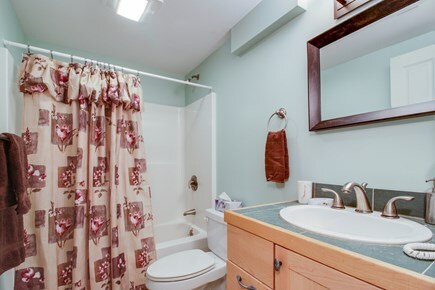 Get washed and ready in this full bathroom. 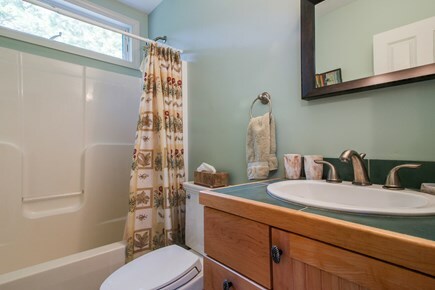 There is room for everyone to get ready in this second full bath. 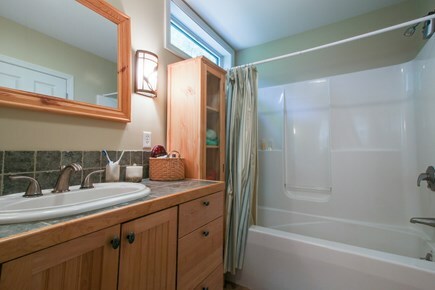 Take a bath in this third full sized bathroom. Grill up some steaks on the back deck. The kids will have plenty of room to play in the back yard. 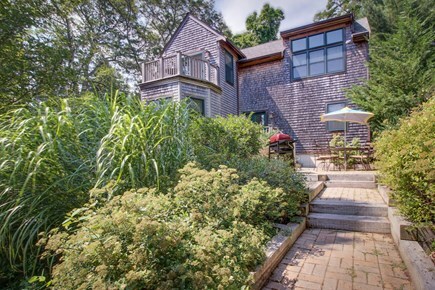 Secluded and quiet, within walking distance to the scenic Lagoon, and with access to a bike path, this cozy and well-maintained Vineyard Haven vacation rental is a pure delight. 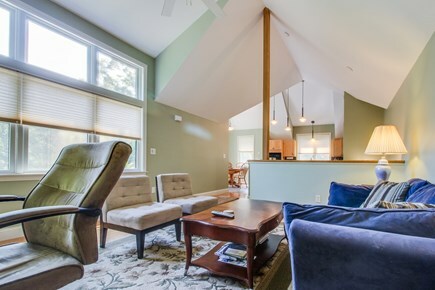 Among the many opportunities for relaxation and sightseeing near this Martha's Vineyard cottage is the Lagoon beach (a mere half mile stroll) and Vineyard Haven and Tisbury proper (a mile-and-a-half drive). Wander the friendly downtown area on foot with a camera in hand. Meanwhile, there’s an easily accessed bike path near the property, so bring your cruiser if you have one! 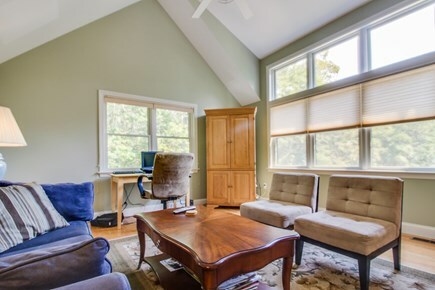 Open, light, and airy, with many new furnishings and appliances, this vacation home is perfect for a family of six or a group of friends looking for simplicity. 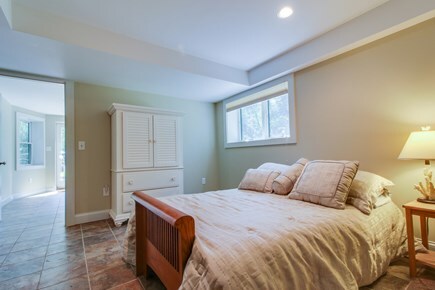 Complete with central AC and heat (rare on Martha's Vineyard), summers and winters will both be comfortable. Socialize outdoors on the furnished patio, balcony with cafe seating, or the grassy yard. The patio features a gas grill for a summer cookout. Go straight from the beach to a freshly made lunch after rinsing off sand in the convenient outdoor shower. Catch a game show on the cable-equipped TV, or watch a movie on the DVD/VCR player. Plan a lighthouse tour using the provided WiFi or simply enjoy each other’s company over coffee. 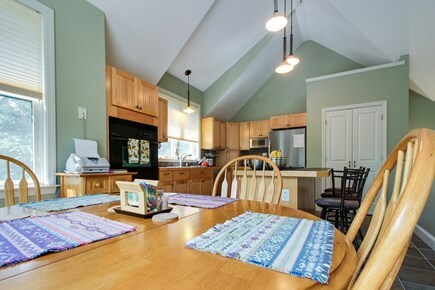 Just across from the living room, in the fully stocked kitchen, you'll find a coffeemaker, blender, toaster, slow cooker, and, of course, a dishwasher for easy cleanup after a fresh breakfast of pancakes with Vermont maple syrup. The sun-weary will be happy to retire to one of the three bedrooms. 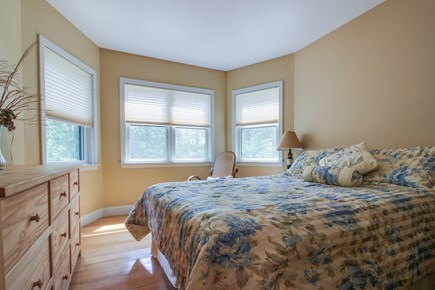 Two have a spacious queens (with the basement offering a futon rather than a bed) and boast either a bay window or high ceilings for a bright and airy atmosphere. 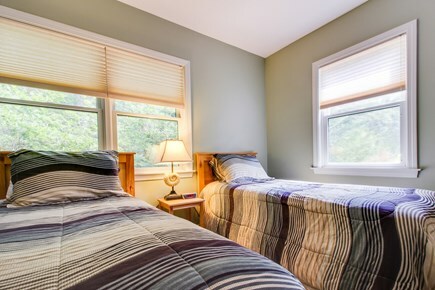 In the third bedroom, you’ll find two twin beds that are perfect for older kids. With three bedrooms come three bathrooms for extra convenience. This home sleeps six comfortably. Downstairs is a TV and sitting room as well as a washer and dryer. Also, please note that a 4x4 is required in winter as this home is accessed by a steep driveway. Explore all of Martha's Vineyard from this lovely manse. On the south end is the Long Point Wildlife Refuge for prime birdwatching and just to the east is popular South Beach. Tracing the island are historic lighthouses - take a day trip to explore them all! Hop on the ferry to neighboring Nantucket for a voyage to discover another popular enclave off the Cape Cod coast. 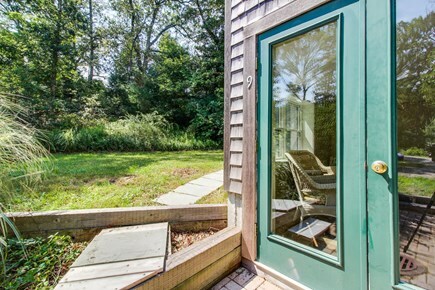 For your next summer getaway or weekend retreat, book this Martha's Vineyard vacation rental! We entered the address in our car GPS and it took us to another 9 Sylvan Avenue address, which I knew was wrong. We then followed my Map Quest directions which got us to the correct address. I don't know why their are two same addresses noted on Martha's Vineyard. Can easily get anywhere on the island. Access to house is at the end of unpaved road. The driveway goes down a hill that many cars will bottom out on and without all wheel drive in adverse weather, will not be able to get out of. As is with most of the island, skunks do make an appearance. Even with the trash cans bungee cords over the lids, they still got in. Had to push the can over with a large stick after several hours of them not leaving. Consumables, (toilet paper, paper towels, trash bags, Dish soap) are minimal highly recommend picking up extras upon arrival. Beautiful home. In quite surroundings. I love the peacefulness. The home was a relatively newer home. It is close to town and the ferry. Everything was clean and fresh. We appreciated the front patio and the little deck. Beautiful home in a secluded yet close enough to town location. Very roomy and looked as nice as the photos. It was a happy surprise to find lawn chairs there which was great to use for the day. Highly recommend! A great place to relax after a day at the beach or touring the island. It's quiet yet centrally located and secluded from the hustle and bustle surrounded by trees yet close to everything you might want to do. 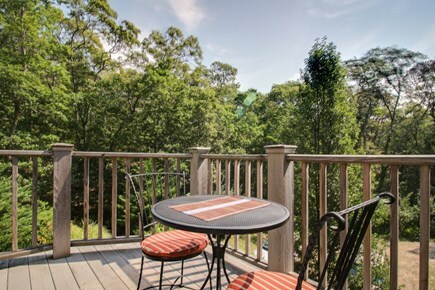 Enjoyed having morning coffee on the balcony overlooking the trees. You will be glad you came. Who loved our stay ! 5 stars! The evening sky's were amazingly clear and thousands of stars visable . Great on site service by Donald the Vacasa rep!! Nature's Pocket was perfect for a quick weekend on the island. My fiance and I, along with 2 other couples, stayed here for a long weekend for a friends wedding. It was a great option compared to the hotels and B&Bs on the island. Easy to get to, central location, and a nice clean home to come back to after a long day of celebrating was clutch. 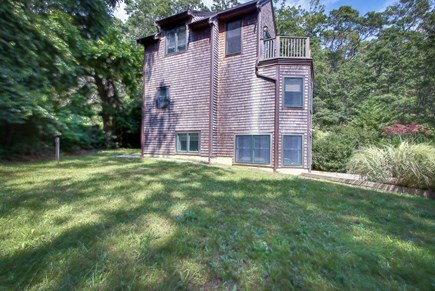 We would recommend this home to anyone looking for a nice, quiet pocket of the woods. Lovely, well decorated house. Big kitchen with all the amenties. Extremely clean, in a quiet area. Bringing or renting a car is a highly recommended to get around the island. It was a wonderful and relaxing 6 days! We loved the house and would certainly go back.